A ruined Spanish businessman has driven a car carrying gas cylinders into the front of the ruling Popular Party's headquarters in Madrid, police say. The car did not explode and no-one was hurt, but the attack triggered a major security alert. The man, 37, was said to have blamed Prime Minister Mariano Rajoy's government for his problems. 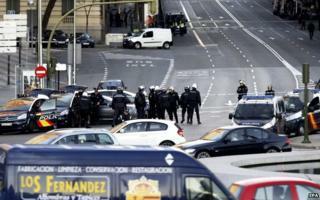 The central Madrid street was cordoned off as police investigated whether explosives were inside the car. The driver was arrested and a robot was used to examine his Citroen Xantia car. Madrid Popular Party President Esperanza Aguirre told Spanish media that the car had been driven into the building in Genova Street "at incredible speed" and had nearly hit a cleaning lady. Other reports cast doubt on the man's claims that he was a businessman at all. Residents in the man's home village of Teruel in north-east Spain told ABC website he had suffered from psychiatric problems and had been unemployed for some time. Spain has 5.4 million unemployed - a jobless rate of 24% - and almost half have been out of work for more than two years. Mr Rajoy signed a deal this week to extend long-term unemployment benefits which are only available for up to two years. Jobless people with families will now be able to receive €426 (£334, $522) a month for half a year after other unemployment benefits run out. Spain's recession ended in 2013 and growth of 1.3% is expected this year. However Mr Rajoy acknowledged that the recovery "has not come to everyone, nor to everyone equally".